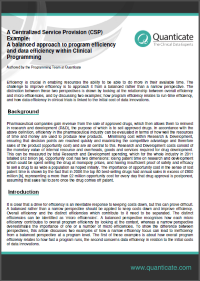 This white paper titled, 'A balanced approach to program efficiency and data efficiency within Clinical Programming', looks at how the different perspectives to achieving efficiency in Clinical Programming can be achieved. The article explores balanced perspectives over narrow perspectives and how overall efficiencies and distinct efficiencies need to be separated. The distinct efficiencies can be identified as ‘micro efficiencies’. A balanced perspective recognises how each micro efficiency contributes to overall program efficiency by looking at the context, whereas a narrow perspective overestimates the importance of one or a number of micro efficiencies. To show the difference between perspectives, this article discusses two examples of how a narrow efficiency focus can lead to inefficiency from a balanced perspective at a program level. The first of these examples is about how overall program efficiency relates to how fast a program runs, the second concerns data efficiency in relation to the initial costs of data innovations.